Jan. 17: Civilian contractors Martin Glazer and Peter McSheffrey are killed in an attack on a Kabul restaurant. Oct. 29 -- Master Cpl. Byron Greff, 3rd Battalion Princess Patricia's Canadian Light Infantry, died in suicide bombing of a NATO bus in Kabul that killed 17 people. June 25 -- Master Cpl. Francis Roy was found mortally wounded by fellow soldiers at a forward operating base in Kandahar city. His death is still under investigation by military police, but enemy action has been ruled out. He was a member of the Canadian Special Operations Regiment. May 27 -- Bombardier Karl Manning, 31, was found dead at a remote outpost in the Zangabad area of Panjwaii district. An investigation found his death was not the result of enemy action and no foul play was suspected. Manning, of Chicoutimi, Que., was nearing the end of an almost seven month deployment with the 1st Battalion Royal 22e Regiment battle group. Mar. 27 -- Cpl. Yannick Scherrer, 24, killed by an improvised explosive device or IED during a foot patrol outside the village of Nakhonay. Scherrer, of Montreal, was a member of 1st Battalion, Royal 22e Regiment, and was on his first tour of duty in Afghanistan. Dec. 18 -- Cpl. Steve Martin, 24, from 3rd Battalion Royal 22e Regiment, was killed by an IED while on foot patrol in the vicinity of a major road construction project in a volatile district of Kandahar. Nov. 26 - The Defence Department says Capt. Frank Paul, who died Feb. 10 of natural causes in Canada while on leave from Afghanistan, is considered to have been on duty and a member of the mission at the time of his death. He was with 28 Field Ambulance based in Ottawa, and was the adjutant for the health services support unit of Joint Task Force Afghanistan. Aug. 30 - Cpl. Brian Pinksen, a reservist with 2nd Battalion of the Royal Newfoundland Regiment, based in Corner Brook, N.L., died in hospital in Germany from injuries sustained in an IED blast during an Aug. 22 patrol in the Panjwaii district of Kandahar province. July 20 - Sapper Brian Collier, 24, born in Toronto and raised in Bradford, Ont, was killed by an IED blast while on a foot patrol in the village of Nakhonay, about 15 kilometres southwest of Kandahar city. Collier was a member of 1 Combat Engineer Regiment based at CFB Edmonton. June 26 - Master Cpl. Kristal Giesebrecht, 34, born in Wallaceburg, Ontario and Pte. Andrew Miller, 21, born in Sudbury, died when the vehicle they were in hit an IED about 20 kilometres west of Kandahar City. June 21 - Sgt. James MacNeil, 28, of Glace Bay, N.S., was killed by an IED near the village of Nakhonay, 15 kilometres southwest of Kandahar city. He was based out of Petawawa with the 2 Combat Engineer Regiment. June 6 - Sgt. Martin Goudreault, 35, was killed by an IED in the Panjwaii district. The Sudbury, Ont. native was with the Edmonton-based 1 Combat Engineer Regiment and in Afghanistan as part of the 1st Battalion, The Royal Canadian Regiment Battle Group. May 24 - Trooper Larry Rudd, 26, of the Petawawa, Ont.-based Royal Canadian Dragoons, died after an IED detonated near the Panjwaii district village of Salavat while he was on a combat resupply patrol. He was from Brantford, Ont. May 18 - Col. Geoff Parker, 42, of the Royal Canadian Regiment and born and raised in Oakville, Ont., killed in a car bomb attack in Kabul. Parker was the highest-ranking soldier killed in Canada's mission in Afghanistan. May 14 - Pte. Kevin McKay, 24, of 1st Battalion, Princess Patricia's Canadian Light Infantry, killed by an IED about 15 kilometres southwest of Kandahar city. May 3 - Petty Officer Craig Blake of Simcoe, Ont., died after a roadside bomb detonated about 25 kms. southwest of Kandahar city. The 37-year-old was a diver based in Shearwater, N.S. April 11 - Pte. Tyler William Todd, 26, died in a powerful roadside bomb blast while on foot patrol southwest of Kandahar city. Todd was a member of 1st Battalion, Princess Patricia's Canadian Light Infantry, based in Edmonton. March 20 - Cpl. Darren James Fitzpatrick, died in hospital from wounds sustained in an IED blast March 6 during a foot patrol west of Kandahar city. Fitzpatrick was a member of 3rd Battalion, Princess Patricia's Canadian Light Infantry, based in Edmonton. Feb. 12 - Cpl. Joshua Caleb Baker, died in a training accident on a range near Kandahar city. He was a member of 4th Battalion, Princess Patricia's Canadian Light Infantry, based in Edmonton. Jan. 16 - Sgt. John Faught, 44, died after stepping on an IED near the town of Nakhoney in the Panjwaii district of Kandahar province. Faught was a member of 1st Battalion, Princess Patricia's Canadian Light Infantry, based in Edmonton. Dec. 30 - Sgt. George Miok, 28; Cpl. Zachery McCormack, 21, both of Edmonton; Sgt. Kirk Taylor, 28, of Yarmouth, N.S., and Pte. Garrett Chidley, 21, of Cambridge, Ont., were killed when their armoured vehicle hit an IED in southern Kandahar city. Canadian journalist Michelle Lang, 34, was also killed. Dec. 23 - Lt. Andrew Nuttall, of 1st Battalion Princess Patricia's Canadian Light Infantry, based in Edmonton, was killed when an IED detonated 25 kilometres southwest of Kandahar city. Oct. 30 - Sapper Steven Marshall, 24, of 11 Field Squadron, 1 Combat Engineer Regiment, based in Edmonton was killed 20 kilometres southwest of Kandahar City when his patrol struck an IED. Oct. 28 - Lt. Justin Boyes, 26, of 3rd Battalion, Princess Patricia's Canadian Light Infantry, based in Edmonton, was killed 20 kilometres southwest of Kandahar city by an IED while leading a foot patrol. Sept. 17 - Pte. Jonathan Couturier, 23, of 2nd Battalion, Royal 22e Regiment, based in Valcartier, Que, was killed 25 kilometres southwest of Kandahar city in a roadside blast. Sept. 13 - Pte. Patrick Lormand, 21 of the 2nd Battalion, Royal 22nd Regiment was killed in a roadside IED about 13 kilometres southwest of Kandahar city. Sept. 6 - Maj. Yannick Pepin, 36, of Victoriaville, Que., and Cpl. Jean-Francois Drouin, 31, born in Quebec City, were killed by a roadside bomb southwest of Kandahar city. They were based in Valcartier, Que. Aug. 1 - Cpl. Christian Bobbitt, 23, and Sapper Matthieu Allard, 21, both based in Valcartier, Que., were killed by a roadside bomb in the Zhari district, west of Kandahar city. July 16 - Pte. Sebastien Courcy, 26, killed during an operation in Panjwaii district of Kandahar. Courcy was a member of the 2nd Battalion of the Royal 22e Regiment, also known as the Van Doos, based in Valcartier, Que. July 6 -- Master Cpl. Pat Audet, 38, of Montreal, and Cpl. Martin Joannette, 25, of St-Calixte, Que., died in Zabul province when their helicopter crashed on takeoff. Audet was with 430 Tactical Helicopter Squadron; Joannette with the 3e Battalion, Royal 22e Regiment. Both were based at Valcartier, Que. July 4 -- Master Cpl. Charles-Philippe Michaud, 28, of 2e Batalion, Royal 22e Regiment based at Valcartier, Que., died in a Quebec City hospital from injuries sustained from a landmine while on foot patrol in the Panjwaii district of Afghanistan on June 23. 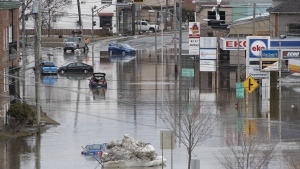 Michaud was from Edmundston, N.B. July 3 -- Cpl. 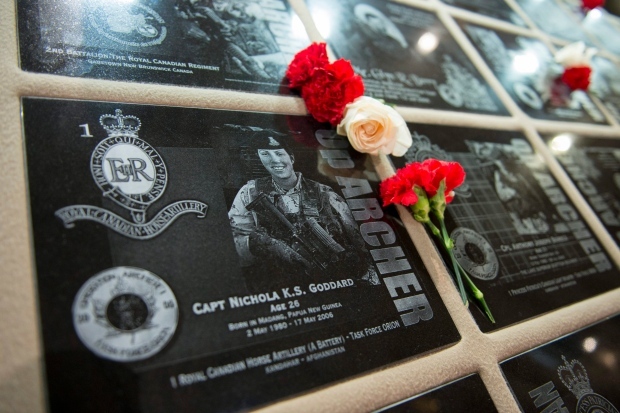 Nick Bulger, 30, of 3rd Battalion, Princess Patricia's Canadian Light Infantry, based in Edmonton, killed by a roadside bomb in Kandahar province. Bulger was raised near Peterborough, Ont. June 14 -- Cpl. Martin Dube, 35, a combat engineer of the 5e Regiment du genie de combat based at CFB Valcartier, killed when a roadside bomb he was trying to defuse exploded. June 8 -- Pte. Alexandre (Pelo) Peloquin, 20, killed in a roadside bomb explosion during a foot patrol in the Panjwaii district, about 15 kilometres southwest of Kandahar city. April 23 -- Maj. Michelle Mendes, 30, the third female Canadian soldier to die in Afghanistan, found dead in an accommodation room at Kandahar Airfield. Mendes was an intelligence officer based in Ottawa. April 13 -- Trooper Karine Blais, 21, the second female Canadian soldier to die in Afghanistan, killed in a roadside bomb explosion in the Shah Wali Kot district. Blais was just two weeks into her first tour of duty in the country. March 20 -- Master Cpl. Scott Vernelli and Cpl. Tyler Crooks killed in a blast in Zhari district; Trooper Jack Bouthillier and Trooper Corey Joseph Hayes, killed two hours later in an explosion in the Shah Wali Kot district. March 8 -- Trooper Marc Diab, 22, is killed in a roadside bomb explosion in the southern Shah Wali Kot district, north of Kandahar. March 3 -- Warrant Officer Dennis Raymond Brown, Cpl. Dany Fortin and Cpl. Kenneth O'Quinn died when a massive explosive detonated near their armoured vehicle in Arghandab district northwest of Kandahar. Jan. 31 -- Sapper Sean Greenfield, 25, was killed when his armoured vehicle struck a roadside bomb in the volatile Zhari district west of Kandahar city. Jan. 6 -- Trooper Brian Richard Good, killed in IED blast near his armoured vehicle in district of Shah Wali Kowt, 35 kilometres north of Kandahar city. Dec. 27 -- Warrant Officer Gaetan Roberge and Sgt. Gregory John Kruse were killed by a roadside bomb during a security patrol in the Panjwaii district of Kandahar province. Dec. 26 - Private Michael Freeman was killed when his vehicle hit an IED device in Zhari district. Dec. 13 -- Cpl. Thomas James Hamilton, Pte. John Michael Roy Curwin and Pte. Justin Peter Jones, all members of 2nd Battalion, The Royal Canadian Regiment based at CFB Gagetown, N.B., killed in explosion that hit their vehicle about 14 kilometres west of Kandahar city. Dec. 5 -- Cpl. Mark Robert McLaren, Pte. Demetrios Diplaros and Warrant Officer Robert Wilson were killed in Arghandab district west of Kandahar city when their armoured vehicle rolled over an IED device. All three were members of 1st Battalion, Royal Canadian Regiment, based in Petawawa, Ont. Sept. 7 - Sgt. Prescott (Scott) Shipway, of Esterhazy, Sask., 2nd Battalion, Princess Patricia's Canadian Light Infantry based in Shilo, Man., killed by a roadside bomb explosion in the Panjwaii district of Kandahar. Sept. 3 - Cpl. Andrew Grenon, Cpl. Mike Seggie and Pte. Chad Horn, all members of 2nd Battalion, Princess Patricia's Canadian Light Infantry based in Shilo, Man., are killed in an attack on their armoured vehicle in Zhari district. Aug. 20 - Sapper Stephan John Stock, Cpl. Dustin Wasden and Sgt. Shawn Eades are killed when an IED hit their vehicle in Zhari district. All three were with 12 Field Squadron, 1 Combat Engineer Regiment based in Edmonton. Aug. 11 - Master Cpl. Erin Doyle, based in Edmonton, was killed when insurgents attacked a remote combat outpost in the Panjwaii district of Kandahar. Aug. 9 - Master Cpl. Josh Roberts, an infantryman based in Shilo, Manitoba, died of injuries following a battle involving coalition forces, insurgents and security personnel from a civilian convoy in Zhari district near Kandahar city. July 18 - Cpl. James Hayward Arnal, based at Shilo, Man., died in a roadside explosion during a foot patrol in Panjwaii district near Kandahar city. July 6 - Pte. Colin William Wilmot, a military medic based in Edmonton, died in an explosion while on foot patrol in Panjwaii district near Kandahar city. July 4 - Cpl. Brendan Anthony Downey, a military policeman based in Dundurn, Sask. Found dead in sleeping quarters in a secret base in the Arabian desert. A non-combat casualty. June 7 - Capt. Jonathan Sutherland Snyder, of Penticton, B.C., from 1st Battalion Princess Patricia's Canadian Light Infantry, based in Edmonton, dies after falling into a well during a night patrol in a field in Zhari district, west of Kandahar. June 3 - Capt. Richard Steve Leary, 32, of Brantford, Ont., from 2nd Battalion, Princess Patric's Canadian Light Infantry based in Shilo, Man., is killed in a gun battle with insurgents in Panjwaii district outside Kandahar city. May 6 -- Cpl. Michael Starker, 36, of Calgary, of the 15 Field Ambulance Regiment based in Edmonton, is killed in a gun battle with Taliban militants outside of Kandahar. April 4 -- Pte. Terry John Street, 24, of Hull, Que., from 2nd Battalion, Princess Patricia's Canadian Light Infantry, based in Shilo, Man., killed when his vehicle hit an IED in Panjwaii district. March 16 -- Sergeant Jason Boyes, 32, of Napanee, Ont., from 2nd Battalion, Princess Patricia's Canadian Light Infantry, Shilo, Man., killed by an explosion while on foot patrol in Panjwaii district of Kandahar province. March 11 -- Bombardier Jeremie Ouellet, 22, of Matane, Que., from 1st Regiment Royal Canadian Horse Artillery, Shilo, Man., found dead at Kandahar Airfield. Military says death not related to combat. March 2 -- Trooper Michael Yuki Hayakaze, 25, from Lord Strathcona's Horse, Edmonton, killed by roadside bomb in Mushan, 45 kilometres west of Kandahar City. Jan. 23 -- Sapper Etienne Gonthier, 21, of St-Georges, Que., near Quebec City, serving with 5ieme Regiement du Genie de Combat, killed when light armoured vehicle was hit by roadside bomb in Panjwaii district. Jan. 15 -- Trooper Richard Renaud, 26, of Alma Que., a member of the 12e Regiment blinde du Canada, killed when the Coyote light armoured vehicle he was travelling in hit a roadside bomb while on patrol in the Arghandab district, north of Kandahar city. Jan. 6 -- Warrant Officer Hani Massouh, 41, and Cpl. Eric Labbe, 31, of 2nd Battalion, Royal 22nd Regiment, killed when their armoured vehicle rolled over in wet, rugged terrain southwest of Kandahar City. Dec. 30 -- Gunner Jonathan Dion Jonathan Dion, 27, a gunner with the 5th Regiment d'Artillerie legere du Canada, killed and four others injured when their vehicle hit a roadside bomb in southern Afghanistan. Nov. 17 -- Cpl. Nicolas Raymond Beauchamp of the 5th Field Ambulance in Valcartier and Pte. Michel Levesque of the Royal 22nd Regiment, killed when their light armoured vehicle hit a roadside bomb near. Sept. 24 -- Cpl. Nathan Hornburg, 24, with the King's Own Calgary regiment, killed by a mortar shell while trying to repair a Leopard tank in southern Afghanistan. Aug. 29 -- Maj. Raymond Ruckpaul dies from gunshot inside a secure NATO compound in Kabul. Aug. 22 -- Master Warrant Officer Mario Mercier and Master Cpl. Christian Duchesne killed by roadside bomb west of Kandahar city. Aug. 19 -- Pte. Simon Longtin killed by a roadside bomb west of Kandahar city. July 4 -- Cpl. Cole Bartsch, Capt. Matthew Johnathan Dawe, Pte. Lane Watkins, Cpl. Jordan Anderson, Master Cpl. Colin Bason and Capt. Jefferson Francis, killed by a roadside bomb west of Kandahar city. June 20 -- Sgt. Christos Karigiannis, Cpl. Stephen Frederick Bouzane and Pte. Joel Vincent Wiebe, killed by a roadside bomb west of Kandahar city. June 11 -- Trooper Darryl Caswell killed a roadside bomb north of Kandahar. May 30 -- Master Cpl. Darrell Jason Priede, killed when a U.S. helicopter was reportedly shot down by the Taliban in Helmand province. May 25 -- Cpl. Matthew McCully killed by an IED in Zhari district. April 18 -- Master Cpl. Anthony Klumpenhouwer, who served with elite special forces, died after falling from a communications tower while on duty conducting surveillance in Kandahar city. A subsequent investigation concluded Klumpenhouwer was knocked from the tower by a surge of electricity. April 11 -- Master Cpl. Allan Stewart and Trooper Patrick James Pentland, killed when their Coyote vehicle struck an IED. April 8 -- Sgt. Donald Lucas, Cpl. Aaron E. Williams, Pte. Kevin V. Kennedy, Pte. David R. Greenslade, Cpl. Christopher P. Stannix and Cpl. Brent Poland killed when their vehicle hit a roadside bomb. March 6 -- Cpl. Kevin Megeney killed in accidental shooting at NATO base in Kandahar. Nov. 27 -- Chief Warrant Officer Bobby Girouard and Cpl. Albert Storm killed by suicide car bomber. Oct. 14 -- Sgt. Darcy Tedford and Pte. Blake Williamson killed in ambush. Oct. 7 -- Trooper Mark Andrew Wilson killed by roadside bomb. Oct. 3 -- Sgt. Craig Gillam and Cpl. Robert Mitchell killed in series of mortar, rocket attacks. Sept. 29 -- Pte. Josh Klukie killed by explosion in Panjwaii while on foot patrol. Sept. 18 -- Pte. David Byers, Cpl. Shane Keating, Cpl. Keith Morley and Cpl. Glen Arnold killed in suicide bicycle bomb attack while on foot patrol in Panjwaii. Sept. 4 -- Pte. Mark Graham killed when two NATO planes accidentally strafed Canadian troops in Panjwaii district. Sept. 3 -- Sgt. Shane Stachnik, Warrant Officer Frank Robert Mellish, Pte. William Cushley and Warrant Officer Richard Francis Nolan killed in fighting in Panjwaii district. Aug. 22 -- Cpl. David Braun killed in suicide attack. Aug. 11 -- Cpl. Andrew Eykelenboom killed in suicide attack. Aug. 9 -- Master Cpl. Jeffrey Walsh killed by apparent accidental discharge of rifle. Aug. 5 -- Master Cpl. Raymond Arndt killed when his G-Wagon patrol vehicle collided with truck. Aug. 3 -- Cpl. Christopher Reid killed by roadside bomb. Sgt. Vaughan Ingram, Cpl. Bryce Keller and Pte. Kevin Dallaire killed in rocket-propelled grenade attack. July 22 -- Cpl. Francisco Gomez and Cpl. Jason Warren killed when car packed with explosives rammed their armoured vehicle. July 9 -- Cpl. Anthony Boneca killed in firefight. May 17 -- Capt. Nichola Goddard killed in Taliban ambush. She was first Canadian woman to be killed in action while serving in combat role. April 22 -- Cpl. Matthew Dinning, Bombardier Myles Mansell, Lt. William Turner and Cpl. Randy Payne killed when their G-Wagon destroyed by roadside bomb. March 29 -- Pte. Robert Costall killed in firefight with Taliban. March 2 -- Cpl. Paul Davis and Master Cpl. Timothy Wilson killed when their armoured vehicle ran off road. Jan. 15 -- Glyn Berry, British-born Canadian diplomat, killed in suicide bombing. Nov. 24 -- Pte. Braun Woodfield killed when his armoured vehicle rolled over. Jan. 27 -- Cpl. Jamie Murphy killed in suicide bombing while on patrol. Oct. 2 -- Sgt. Robert Short and Cpl. Robbie Beerenfenger killed in roadside bombing. April 18 -- Sgt. Marc Leger, Cpl. Ainsworth Dyer, Pte. Richard Green and Pte. Nathan Smith killed when U.S. F-16 fighter mistakenly bombed Canadians.